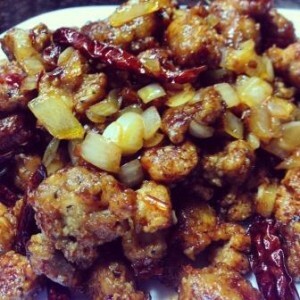 Spicy Szechuan Chicken | Just Cuc It! #9 Spicy Chicken please! We are creatures of habit. Once you find a dish you love from your neighborhood chinese delivery place, you tend not to stray too far from what you know you love! 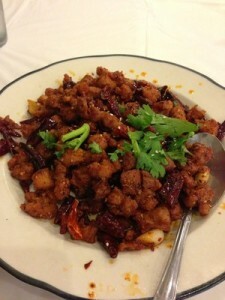 At Mala Sichuan Bistro, the spicy dry chili chicken dish is intoxicatingly good! 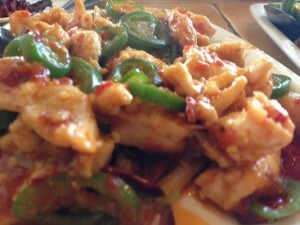 At FuFu’s Cafe, the spicy chicken is cooked with dozens of sliced jalapenos and dried thai peppers. So Josh has been asking me to try it in my own kitchen . . .so I CUC’ed it! Prepare the marinade: In a large bowl, combine the soy sauce, rice wine, and egg whites. Coat the chicken with the marinade mixture and let sit for 10 minutes. Mix together the ingredients for the sauce: sate chili sauce, soy sauce, chicken stock or water, balsamic vinegar, cornstarch, and Sichuan pepper. Set aside. In a large bowl or plate, mix together the cornstarch, salt, and pepper. Dredge the chicken in cornstarch mixture and shake off the excess cornstarch. Heat the 2 cups of peanut or vegetable oil in your pan on high until it registers 350°F on an instant-read oil thermometer. Working in 2 or 3 batches, add the first batch of chicken cubes and fry until golden brown on the outside and cooked through, about 4 to 5 minutes. Remove the chicken with a slotted spoon and drain on paper towels. Repeat with the rest of the chicken. Drain the oil into a heatproof container and save for discarding. Wipe the pan with a paper towel to remove any brown bits, but don’t wash.
Reheat the pan over medium-high heat. Add another 1 tablespoon of oil and swirl to coat the base and sides. 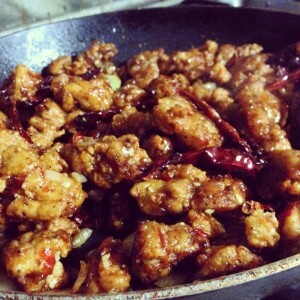 Add the dried chilis to the pan and stir-fry until they start to blister, about 30 to 60 seconds. Add the diced onion, garlic and ginger and stir-fry for 2 minutes. Stir in sauce mixture and simmer until slightly thickened, about 1 minute. Add the fried chicken, toss to combine, and remove from heat. Serve immediately with jasmine rice.